When I sat down to write my first novel, no one ever told me that choosing a cover would be harder than writing the book. In the last few months, while awaiting the publication of The Gold Dragon Caper, fourth book in the Damien Dickens series, I have been redesigning the covers for the first three books. No one ever told me that the third cover would be the most difficult! The Chocolate Labradoodle Caper is a book very close to my heart. I wrote most of the first draft in the months following the death of Quintzy, our 13-year old Chocolate Labradoodle. His photo graces the original cover of the novel. Woven through the various major plot elements is the question of whether or not Damien and Millie will accept a puppy from a friend who is launching a new dog breeding program. The tension between the husband and wife over whether or not to acquire a dog colors some of their actions and decisions as they work together to solve a pair of interwoven mysteries. In redesigning the cover, I first looked to the various settings and plot elements: shenanigans surrounding the management of a Caribbean cruise line; a chocolate factory; a hit-and-run attempt on the life of one of the characters; and a photo-journalist. While some of the images were intriguing, none of them really called to me. I just couldn’t bear to leave Quintzy off the cover of The Chocolate Labradoodle Caper. At last, I allowed my heart to overcome my head and I decided on this image of Quintzy’s first visit to the beach. He was only 14 weeks old and wasn’t sure what to make of the experience. The tag that is dangline from the ‘C’ in ‘Caper’ was the ID tag Quintzy wore as a puppy. I hope you enjoyed sharing the story of my adventure in cover design. My eternal thanks to my cousin, the talented Hilary Quint, who has guided me with great patience and insight through the redesign of all three book covers. I hope you will take a moment to visit her blog site, The Smitten Image. I’ve always thought of The White Russian Caper as my middle child. For whatever reason – and it’s probably no one’s fault but my own – the second book in the Damien Dickens series has received less attention, and garnered fewer reviews, than either of its siblings. Hello Phyllis. Congratulations! Today is a wonderful day! Why? 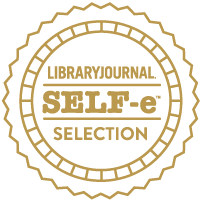 Because your IHIBRP 5 Star Recommended Read Award Badge is here! You can find out more about the IHI Book Review Program at Author JB Richards’ website. While you’re there, I would encourage you get to know JB and her work. If you are interested in finding out more about my Damien Dickens Mysteries, please browse through the rest of my Gone Writing website.